Samarium 62: No Relation. 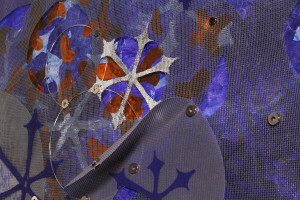 This piece is part of the Studio Art Quilt Associates’ Radical Elements invitational exhibition. A photo of the entire work is embargoed until its debut exhibition in May 2014. It is made from materials other than fabric and thread, and ‘quilted’ with magnets. The piece overlaps two series: Samaras and Circlesss.